Ian Paisley MP was in attendance at a gala dinner at the weekend at the Royal Court Hotel in Portrush hosted by the Robert Quigg V.C. Commemoration Society. The event was the most recent of a series of fundraising events to generate the funding for a memorial statue to the Victoria Cross recipient in his home town of Bushmills. In a helpful coincidence the dinner was held just days after the most recent awarding of a Victoria Cross to Lance Corporal Joshua Leakey, who is now the only living recipient of the medal after his bravery in rescuing an infantry soldier and mounting an offensive on Taliban insurgents during a mission in August 2013, eliminating 11 Taliban members in the process. The evening was hosted by Paul Clarke MBE and had various speakers including the Society Chairman Leonard Quigg, the great nephew of Private Quigg. Mr Quigg received his award for his outstanding bravery in the First Day of the Battle of the Somme in 1916 were he saved no fewer than seven of his injured comrades in 1916. Ian Paisley MP has called on the House of Commons to do more to celebrate the actions of those military personnel who have been awarded the Victoria Cross. Mr Paisley’s request comes off the back of Wednesday’s announcement that Lance Corporal Joshua Leakey is to be awarded the medal in recognition of his extraordinary bravery in Afghanistan, becoming only the 15th soldier to be honoured with a Victoria Cross since the 2nd World War. The North Antrim MP made reference to Private Robert Quigg from Bushmills who was awarded the Victoria Cross for his “most conspicuous bravery” at the Battle of the Somme. Speaking after the debate the North Antrim MP added “The stories of Lance Corporal Leakey and Private Quigg bear striking resemblances to each other in the sense of disregarding one’s own safety to tend to injured colleagues. While Private Quigg set out in to no mans land seven times to try and rescue his platoon commander, Lance Corporal Leakey Made three trips up and down a hillside towards the Taliban lines to rescue both an injured American colleague and to gather weaponry to mount an offensive on the enemy”. The Military of Defence this morning described Lance Corporal Leakey as single-handedly changing the course of that entire operation, which was eventually successful with the injured American soldier being the only casualty of the operation whilst eleven insurgents were killed. Local MP Ian Paisley has welcomed the news that the Heritage Lottery Fund have confirmed this week the £178,000 grant that was provisionally awarded to a local project exploring the legacy of the First World War, Battle of the Somme and the Easter Rising last month. The three year project entitled On the Brink: The Politics of Conflict 1914-1916′ will be focused in the areas of the New Mid and East Antrim council and the Causeway. This funding gives us an opportunity to educate our young people and indeed ourselves in much greater detail on the legacy that this period in our history left us and which remains with us today. “This was an extremely significant period in UK politics and society that not only incorporated World War 1, but also the rising tensions closer to home over the Home Rule crisis, which ultimately led to the Easter Rising as well as the Labour and Women’s Rights movements which gathered rapid momentum around this era” said Mr Paisley. The project will incorporate exhibitions, tours and workshops as well as displaying a whole range of artefacts, public memorials and monuments to give us a much greater understanding of the political landscape and the resulting change to our political climate from the events of this time. The North Antrim MP concluded “There has never been a more fitting time to acknowledge and appreciate the significance of this period in our history as we mark the 100 year anniversary of the beginning of World War One. 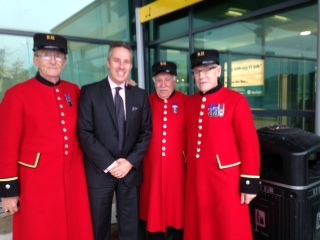 North Antrim MP Ian Paisley was amongst a group of Government representatives, including Prime Minister David Cameron, who met to applaud the 120 representatives of the 1st Mechanized Brigade, led by Brigadier Rupert Jones MBE, as they returned home from duty in Afghanistan this week. 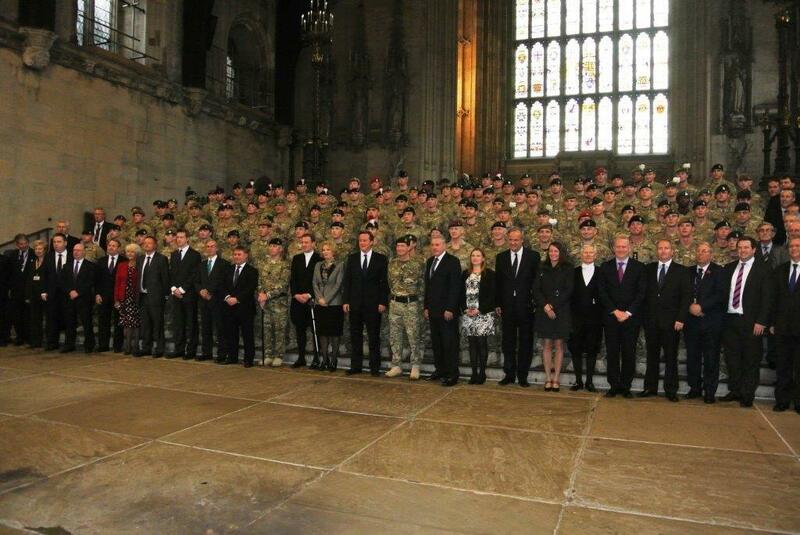 The group were invited to parade to Westminster where hundreds of parliamentary staff joined MPs in welcoming home the troops. Prime Minister Cameron acknowledged the sacrifices made by all of our armed forces and the groundbreaking achievements made by British troops as they prepare to withdraw from Afghanistan and hand over control to the new Afghan Government. I.P Sam Cameron of the Pensioners commented “The welcoming atmosphere of the people of Northern Ireland has been second to none and if anyone wishes to make a return journey in the future they can be assured of a warm welcome at The Royal Hospital Chelsea”, where the Pensioners are based. Ian Paisley MP speaks out for Ballymena war hero in Parliament. This week in the House of Commons, Ian Paisley our MP called on the Government to explain their treatment of local Ballymena war hero, Philip Gillespie. Philip was on tour with the Royal Irish Regiment in Afganistan in January 2011, when he stepped on an improvised expolosive device and lost his right leg. However, undeterred by his injuries, Philip has become an inspirational figure in Northern Ireland and beyond for others who have to deal with such traumatic life-changing events. He recently completed the 6000 mile gruelling Dakur rally as part of fundraising for RacetoRecovery and continues to prove that life can and does go on after such serious injury. However the hero recently went to see our Member of Parliament concerning a matter of grave concern. After a medical assessment the Government informed Philip that he would no longer be entitled to Disability Living Allowance because he uses a prosthetic limb and can therefore walk unimpeded. Philip then went from March until May without receiving his payments because of this reason. Philip has since received payments under the newly implemented military system, but still lost out on money in the months intervening. “I think it’s an complete and utter outrage that one of our country’s bravest men, who was injured serving us in Afghanistan, was subsequently refused DLA by a bureaucrat who quite obviously could never contemplate what Philip had to go through. I am obviously pleased he is now covered under the military system, but the fact of the matter remains that he should never have had to come and see me over such callous mistreatment from our Government system.